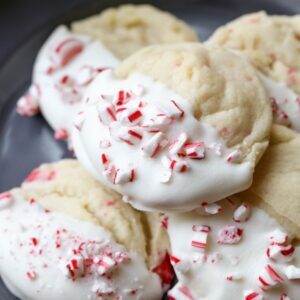 Double Peppermint Crunch Cookies - these soft treats are half-dipped in white chocolate and sprinkled with candy cane bits. In a small bowl, mix together flour, baking soda, and baking powder. Set aside. In a large bowl, cream together butter and sugar until smooth. Beat in your egg and vanilla. Gradually mix in your dry ingredients. Roll out teaspoon sized balls of dough, and place onto an ungreased cookie sheet. Bake at 375 for 8 to 10 minutes, or until golden. Let stand for two minutes then remove to a wire rack. While cookies are cooling, melt candy quick according to package directions. Dip half of each cookie into candy quick. Allow excess to drip off and then place on wax or parchment paper. Sprinkle each with crushed candy. Stick into the fridge to harden.